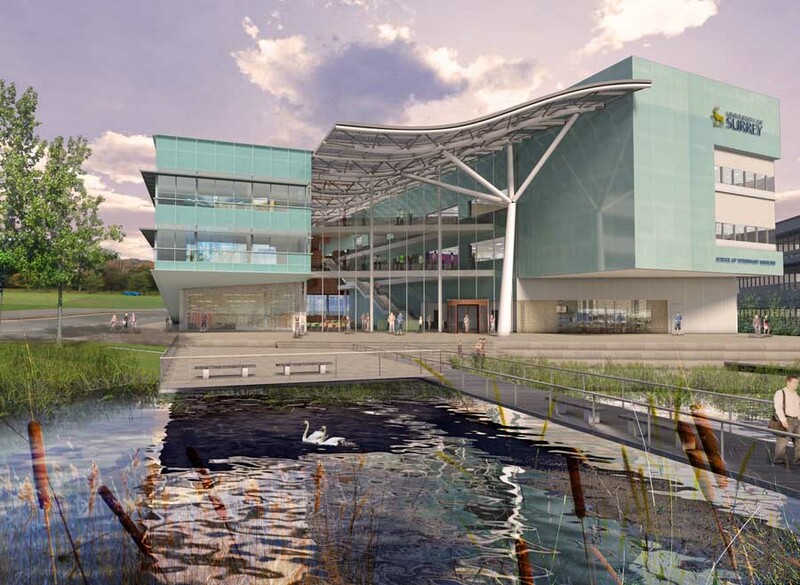 The University of Surrey has appointed leading architecture firm Devereux Architects to create a masterplan for its new School of Veterinary Medicine. As one of the University’s largest and most prestigious future development sites, the new school, which sits within the Faculty of Health and Medical Sciences, will comprise three complimentary and inter-related buildings totalling approximately 9000m2 – an Academic Building, a Veterinary Clinical Skills Centre and a Veterinary Pathology Facility. The new building will be positioned at the corner of the new campus green at Manor Park. It will feature naturally ventilated office and teaching spaces along one side of the atrium and research spaces and lecture halls along the other. In this way the atrium will really act as the lungs for the building. The roof of the atrium is shaped to guide rising, warmed air into the plant room where the heat can be extracted and reused. The new academic building will provide world-class teaching and research laboratories, lecture theatres, and flexible break out spaces organised around a common shared atrium.